It is not, perhaps, my most noble goal, but one of the things I've always wanted to do is to throw a New Year's Eve party. I know, I know; some people have long-held dreams of running marathons and writing novels, but for me, it seems, the pinnacle of achievement is wearing a sparkly dress, hoisting aloft a bacon-wrapped date, and toasting the impending year underneath half a dozen handmade tissue pompoms. What, it's not like I'm proud. I didn't have a whole lot going on in the last few weeks of 2011—my old job had finished and my new one hadn't yet begun—which gave me ample time to put ridiculous amounts of energy into creating the invitations. Seriously, I don't know what I was thinking; an evite would have been fine. Instead, I messed around with sparkly gold paper and numerical stickers and spent an entire afternoon in front of Doctor Oz, handwriting each one until my hand cramped up. In hindsight, I should have just texted everyone and called it a day, but there is a special part of my brain reserved for the appreciation of gilt-edged envelopes and I am sorry, but it kicked into high gear around December 16th. You should know that I also matched my dress to those invitations. I think there's probably a twelve-step program for that. .....and then to the little cocktail stirrers I made for the drinks, which were fun to look at but ridiculous in practice if you were drinking champagne, because the glass was so narrow that they kept poking you in the mouth every time you went to take a sip. Hello, welcome to my party! Can I get you anything? A paper cut on your lip, perhaps? I had some of those cocktail stirrer things left over, actually, so I just turned them into cupcake toppers instead. I know cupcakes are so 2009 and it's all about donuts or cake pops or miniature lattice-crusted pies now or whatever, but I maintain that if you are in the market to give a slightly drunk crowd an instantaneous sugar rush, you cannot go wrong with this cupcake recipe and a tumbler of gold sprinkles. Did you know gold sprinkles are a thing you can actually buy? You do now! Then I went insane and sprayed some mason jars gold. If you've ever wondered what you do when you're between jobs, I have the answer for you right here. You spray mason jars gold. Thank god I no longer have so much time on my hands, right? I almost turned into a caricature of myself. 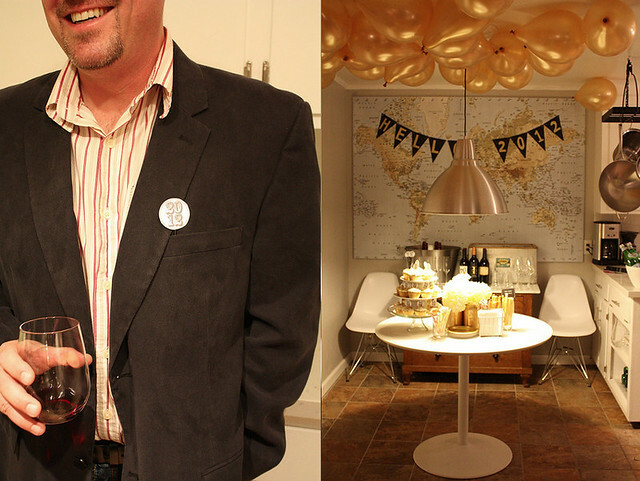 All in all, I was really pleased with how the party turned out, and it certainly fulfilled my need to buy thirty gold helium balloons and spend the afternoon making baked brie on sticks. Happily, I think everyone else had a lot of fun too. 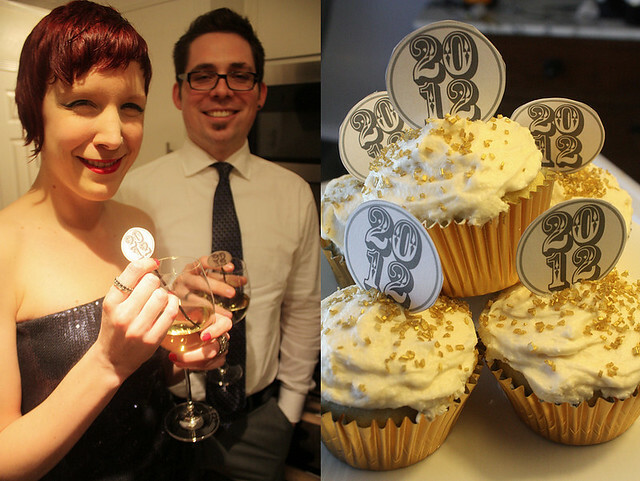 There are quite a few more pictures of our New Year's Eve party here, if you're interested. In the meantime, I hope you're having a happy 2012 so far! 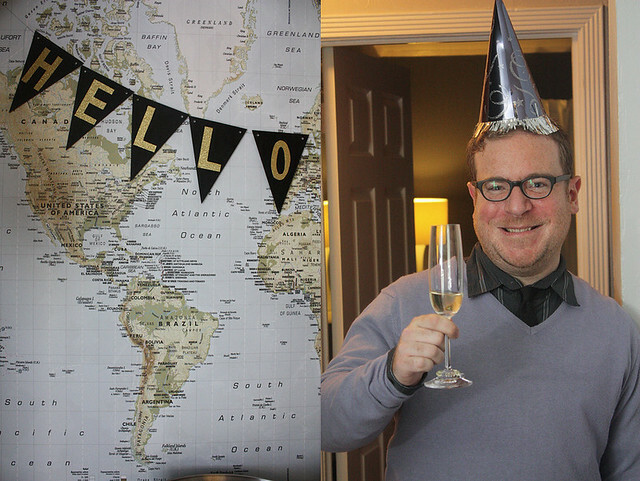 How did you welcome in the new year? Still picking glitter out of your bathmat or is that just me? OH! This looks so fun! And love your dress. 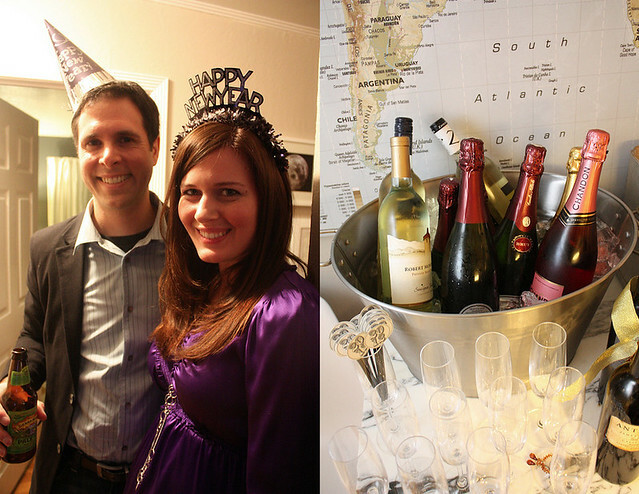 What a great looking party - so sophisticated and love all your DIY touches. Doesn't it make the party that much better when you make things yourself? Love it. Makes me wish I hadn't fallen asleep prior to midnight but I worked right through the festive season and needed some shuteye - new years eve or not! I can't see the photos of the gold Mason jars!! I desperately need to see them... what did you use them for? And where is your dress from? I love it. 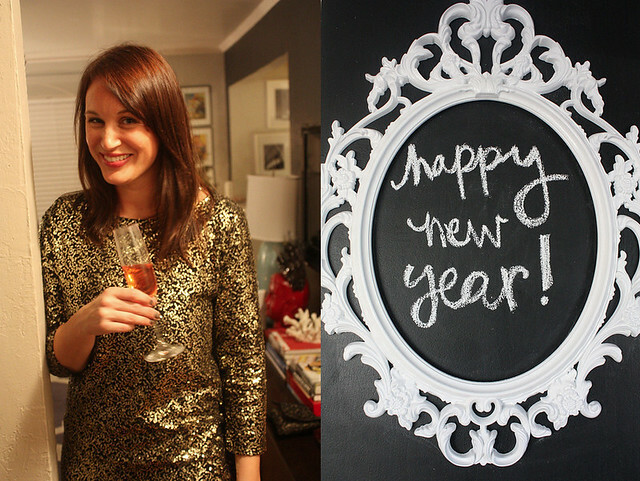 I love this whole post, but I especially love the sunbust mirror in you last photo! Where did you get it? Ok, so much to discuss! First - I am between jobs! I have been wasting so much time! I should have been spraying mason jars gold! 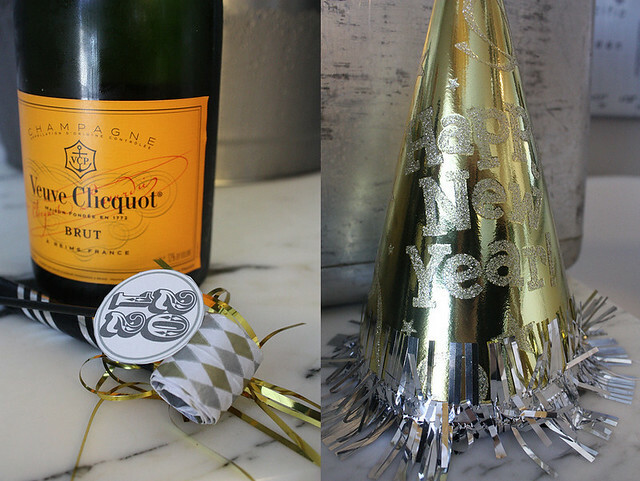 Also, fabulous champagne and decorations and sparkly invites! I think we might be secretly related. I may have spend a few weeks in December obsessively online-shopping and shopping-shopping for sparkly, glittery, metallic dresses. Also, I may have special-ordered a fascinator for New Year's Eve this year (yes, I totally wore this: http://www.etsy.com/transaction/68168705). i'm totally jealous. I spent the first couple of hours of 2012 watching Torchwood: Miracle day. I wish I could have been sent an invitation too just so that I can have it framed for my mantle.. So much to say here! 1. You should always wear your hair long like this, maybe even longer... looks FAB! 2. Moose looks great - has she lost weight? 3. I am honored that you were inspired to do sparkly things on my birthday. Beethoven is honored, too. 4. I am giggling at stir sticks in wine. What a lovely party! I have to ask, though....I am in the market for food labels. Did you make those or buy them? Are the chalkboard paint or just black paper with white pen? Thanks!! Lovely! If you ask me, New Years Eve is an underrated holiday so I'm glad to see you did it the justice it deserves. Ah, so that's what you did with the leftover gold spray paint :) Looks like a great party! Long-time lurker, but this post sealed the deal: Holly, I think we are design twins, but I have half the motivation to take on/finish my projects. I'm an event planner by day, which means my house goes woefully neglected on the design front. May I hire you to come make it half as pretty as yours? You're a peach. I spent my new years on the flight from LA to Melbourne. Moments before the year ticked over we were still on the ground in LA waiting to take off and the 3 year old boy next to me had to use the bathroom Right Now. The flight attendants wouldn't let him because the fasten seat belt was on and so he peed into an empty dorito bag. Hello 2012. What a lovely party! 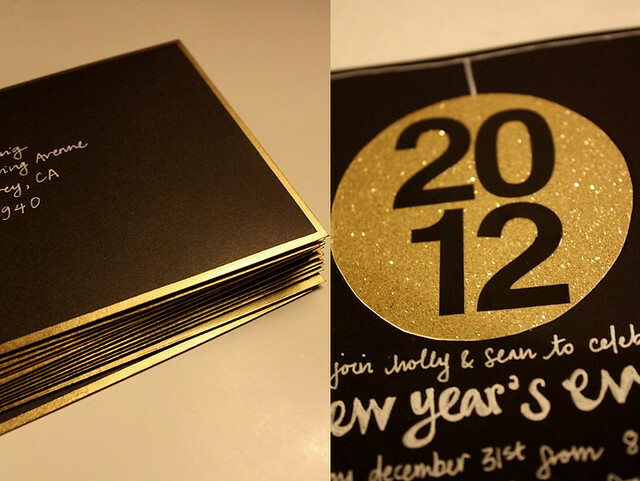 I love the hand lettered glittery invitations, and the gold jars, AND the cheese sticks. 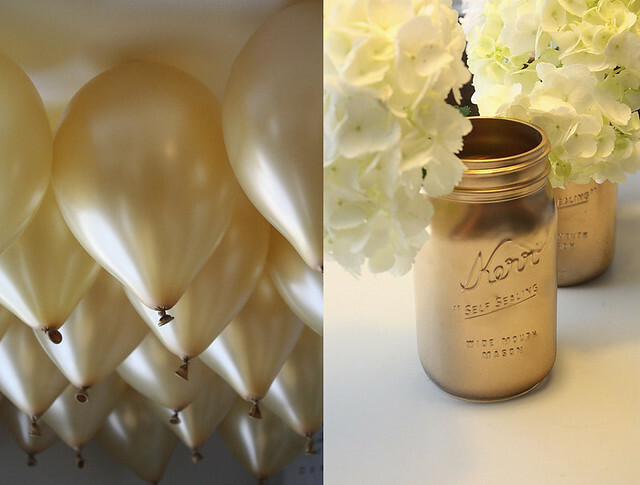 Your photos make me want to plan a gold party just because, and I'm usually a strictly silver type of person. Gold is growing on me. Off to check out that map. . . It must be great to be your friend. And Dan, wow. 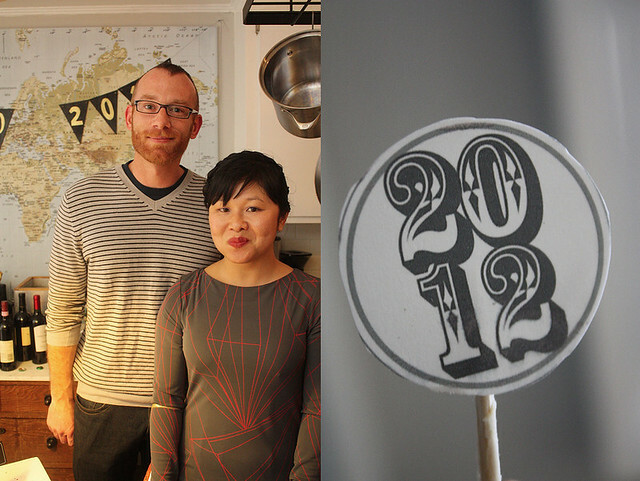 Am I the only one who giggled at that last kitchen picture because it looks like the bunting says "Hell 2012"? Your party looks lovely and I'm totally jealous of your crafting zeal. Need I even raise the obvious that not only did your invitations match your dress, but that EVERYTHING matched the new bar cart?!? I'm going to keep this bookmarked until next NYE!! Love everything about it! Twice File Miles and Camels & Chocolate: My dress is made by Tahari, but I found it on clearance at Marshalls! Anna Louisa: I have a post brewing about this, but basically I bought this gross clock at Ross Dress For Less (you may see a theme emerging here about the super fancy places I like to shop!) and gave it a little makeover so that it now resembles the sunburst mirror you see above. Details to come -- super easy! Katie: Just black card and a white pen! I have a job and I'm still going to run home and spray paint my mason jars gold! Love it! Holly, I love the mason jar idea- they look perfect. Totally stealing this idea for my girlfriend's wedding shower! Oh no. Now I have an obsession with finding gilt-edged everything for my (not yet officially, but) upcoming nuptials. Some frantic Googl-ing has left me in panic mode of MUST FIND! Also: my birthday happens to fall on New Years Day. 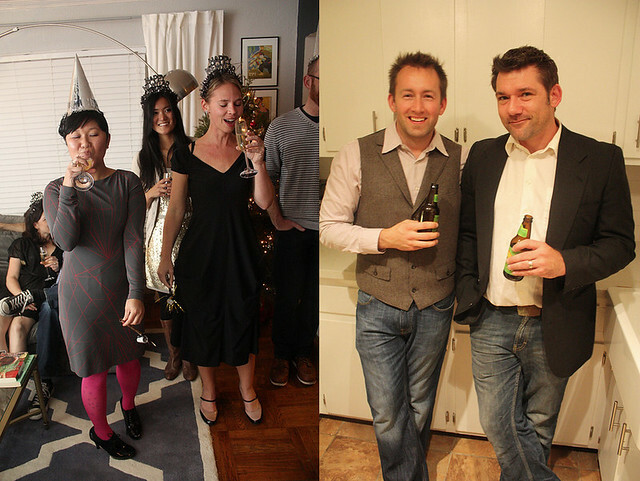 I think NYE parties are the absolute best, and I love every detail you've shown. Thank you for sharing! What a fun party! We have a tradition of having New Year's parties, but they usually involve our children as well so they are never as well-planned and beautiful as yours. This year, we invited several Iraqi families (we work with refugees in Portland) so we toasted in 2012 with sparkling cider and this fun dessert that looks like you're eating a dead muppet. (It's shredded pastry filled with cream cheese and pistachios. Yum) A mix of cultures and traditions, but one thing for sure--Happy 2012 and may it be a year that brings peace. Umm, yeah. I'm going to need to know where the ever-fabulous Amber/Panda/Moose got those shoes. I need to have them in my life. Thanks! 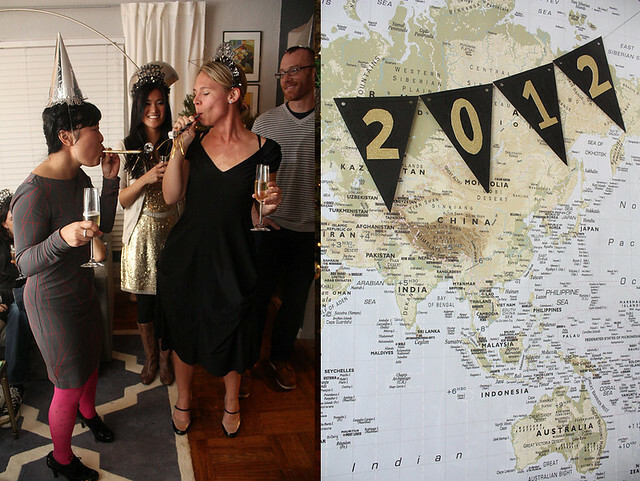 Your NY's party looks like WAY more fun than mine was! Holly, what is the font name that you used for the cupcake picks? What a fantastic looking party! Love the mason jars! Unfortunately the whole family was sick, so we had to bow out of our NYE party that we were going to attend. Kaitlyn: Oh, the envelopes weren't REALLY gilt-edged! I mean, I just went around the edges of them with a gold pen. It took about 10 minutes to do 15 or so, and it ended up looking pretty nice. Melanie: That font is called Rosewood. Jamie: Not sure where Amber got her shoes, but I'm sure she can weigh in! Everyone wondering if Dan is single: Yes, I believe he is. 1) I loved the invitation. It's still hanging from the convenient wire I have for such things. What, not everyone has a Convenient Wire For Hanging Things? Get one! You can hang things on it! 2) Best New Year's party ever. Especially the part where you served hangover bacon the next morning. 3) Jamie: My shoes are Nine West and I got them five years ago at Nordstrom's. Which helps you not at all, I suspect. Also, re Amber/Panda/Moose: Ha! Now my mother just sighs and says, "So what animal are you going to be THIS year?" I bought that exact same sunburst clock at Ross all the way on the East coast! I painted mine a fun kiwi color, but I love how it looks on your wall in gold. I still need to change out the clock face so I can't wait for your tutorial. Thanks for having us. We had a blast! Your place is awesome.